A thousand years ago Córdoba (Spain) was the largest city in the world, with a population three times its current 320,000. It was the capital of the Caliphate of Córdoba, which for several hundred years controlled much of the Iberian peninsula. The Umayyad Caliphate is long gone, but its heritage is visible throughout the historic centre, best represented by the spellbinding Mosque-Cathedral. Mosque / Cathedral of Córdoba – One of Spain’s cultural wonders, this astounding complex dates to the 900s at a time when Córdoba was Europe’s leading city for science and culture under the rule of Emir Abd-ar-Rahman. There could be no finer symbol of this golden age than the forest of columns and horseshoe arches that greet you upon entry, with their two-tone brick and stone pattern. There are 850 columns in total, and the effect of the sunlight that filters through the hall is unforgettable, as is the Mihrab (apse) with its gilded calligraphy. The mosque became a church as soon as Córdoba was retaken in 1236, and from then a number of chapels were built, culminating with the cathedral nave in the 1500s. Patio de los Naranjos – The main entranceway to the complex is the courtyard where Muslim worshippers would perform their ablutions before prayer. Not a great deal has changed since then: The fountains are still here, as is the grid of 98 orange trees that are particularly pretty and fragrant in spring when they’re in bloom. On the north west and east sides of the courtyard are arcaded galleries and if you walk along these and look up you’ll see their original delicately-carved coffered ceilings. On the south side are the 17 horseshoe arches that lead to the Mosque. Alcázar de los Reyes Cristianos – This marvellous royal compound has had a long and complicated history. It was the site of a Visigothic fortress before falling to the Umayyad Caliphate, under which it was expanded in the early-medieval period as the city around it thrived. Gardens, courtyards, baths and the largest library in Western Europe were all added. After Córdoba fell to the Christian forces in the 13th century it became a palace and the seat of the Castilian Royal Court. Later it was the headquarters of the inquisition for three centuries. The gardens alone sprawl across 55,000square metres and were originally fed by the great Albolafia waterwheel that helped channel water from the Guadalquivir River. 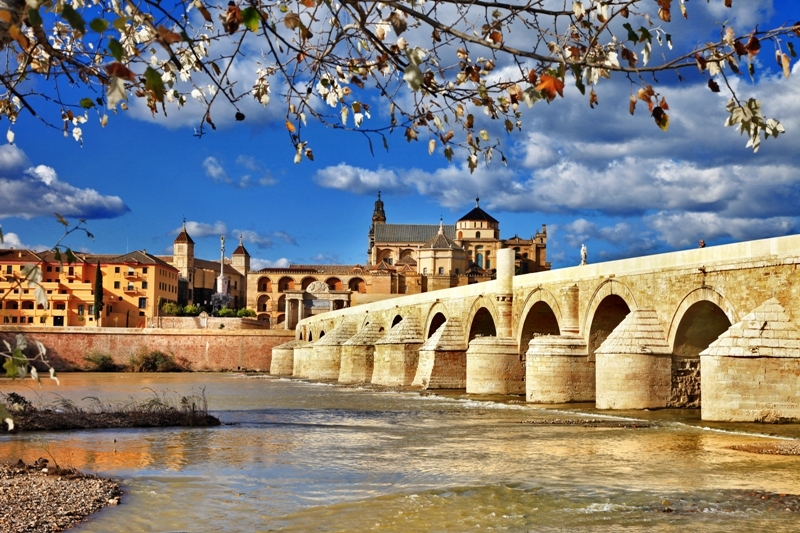 Historic Centre – Córdoba has one of the largest old-towns in Europe, and it’s protected by UNESCO. This city is famed for its patios, large interior courtyards that offered needed shade to the Romans and then the Moors. Also devised to help Córdoba’s citizens keep cool are the twisting alleys, which are remain cloaked in shadow for much of the day. Away from the big monuments just see where your curiosity carries you: A couple of the courtyard doors will be open and you can peek inside, or chance upon a secluded little square with orange trees. Jewish Quarter – North and west of the Grand Mosque is the city’s Jewish quarter, which retains the street-plan it had as a ghetto hundreds of years ago. The Jews were expelled from Spain in the late-15th century, but during the Caliphate Córdoba’s Jewish population thrived and it was home to Maimonides, the 12th-century Sephardic polymath. In the 21st century it’s quite a posh part of the city, home to the Calleja de las Flores (little street of flowers), and true to its name it’s fragrant and colourful at any time of year. The main indication that there was a Jewish population is the Synagogue, one of only three left in Spain. Roman Bridge – Crossing the Guadalquivir along this Augustan footbridge is just one of those things every visitor to Córdoba has to do. The panoramas are postcard-worthy, whether you’re on the south bank viewing the Calahorra Tower and 16 arches with the Great Mosque in the background, or making the exciting crossing to the old city. It dates right back to the 1st century, but the structure today is completely medieval. This helped earn it a role in Season 5 of the TV show, Game of Thrones. Come at sunset when the stones of the bridge and cityscape are bathed in an orange glow. Calahorra Tower – This is a Moorish fortification from the time of the Almohad Caliphate in the early-13th century and guards the southern entrance to the Roman Bridge. Reinforcements were made in the 14th-century during the reign Henry II of Castile, and that’s exactly how it looks today. It did a good job of keeping Henry’s brother Peter the Cruel out of the city in 1369 before becoming a prison and then a girl’s school in the 1800s. Duck inside for a great little museum about life in Al-Andalus, with 3D presentations of the city in this era and insight about how Christians, Jews and Muslims coexisted in the city. Medina Azahara – One of the world’s most beautiful vanity projects, this Moorish city to the west of Córdoba was built by Abd-ar-Rahman III to put the other rulers across the Islamic world in the shade. It was to be the capital of the Caliphate, but despite 25 years of construction only stood for 65 years: It was sacked by North African Berbers and forgotten until 1911. What’s amazing is how well the site has been restored, as you pass through a mosque, marble-paved gardens, offices, bath houses, dignitary’s houses and military structures. The hall is particularly special, where the Caliph received visiting politicians and civil servants. Palacio de Viana – Get to the Santa Marina district to see this sumptuous Palace-Museum and its 12 exquisite courtyards. The building is from the 14th-century with a renaissance facade that was added a century later. A Spanish noble family that had owned the building for generations donated it to the bank Cajasur, which opened it up to the public in the 80s. You’ll see their art and furniture collections in situ and tread with awe through the medieval internal courtyards, each with a slightly different theme and story to tell. Archaeological Museum – When this attraction was being expanded a few years back the builders happened upon a Roman theatre, the largest in Spain, which was a happy coincidence! This site is has been fully excavated and is now a key part of the museum. Most of the museum is in the eight halls and three courtyards of a renaissance palace that was home to the Páez de Castillejo family. Collections go back to prehistory and up to medieval times, but the best bits are from the Iberian and Roman periods. The Iberian Lion of Nueva Carteya is a must: It’s from the 4th century BC and was discovered when a motorway was being built. Plaza de la Corredera – After your adventure through Córdoba’s exotic ruins and old city, here’s a reminder that you’re still in Spain. It’s a classic Castilian plaza that was built in the late-1600s by the Salamancan architect Antonio Ramós Valdés, and measures 113 metres by 55. As with all Spanish central squares it’s one of the centres of daily life and at all sides are arcades that let you escape the glare of the sun in summer. For many years the city’s bullfights were held right here and then it was the site of the city’s food market. Now it’s a vast open space: A fine venue for summer concerts and the elegant backdrop for a stroll at any other time. Hammam – This amenity, a couple of minutes on foot from the mosque, isn’t original, but instead recreates the experience of visiting real Moorish baths. In the Caliphate there were literally hundreds of hammams around the city, but nearly all were demolished because of their dodgy reputation. The building, with its horseshoe arches and gemoetric tiles, is a faithful copy of a bathing complex and was built in 2001, so it’s worth a visit for that alone. And after days of trekking through the city streets you could probably do with a massage or relaxing in these soothing waters for a while. Patios de Córdoba – May is when Córdoba celebrates, and in the 2nd week of the month the city throws open the doors to its many interior courtyards. It’s the most fragrant time to be in the city, when jasmine and orange blossom fills the air and the residents compete to make their courtyards the best in the city. It’s a fabulous way to nose around 50 or more courtyards that you wouldn’t normally see, and people take the competition very seriously, decorating their patios with colourful flower arrangements and mosaics. The city’s many convents and other religious buildings also take part, and at night the city hums with the sound of flamenco guitar. Feria de Córdoba – On the back of the Patios festival is Córdoba’s annual spring fair, which has its roots in the 13th-century. It runs for a week at the end of May and is centred on the recinto, fairgrounds on the southeastern edge of the city, where huge Moorish-style arches invite you in. There are some 100 tents, or casetas, where people go to eat, drink and make merry from the early afternoon until dawn the next day. Sevillanas, classic dances influenced by flamenco and Castilian folk, are integral to the celebrations. Also part of the fun are traditional fairground rides, equestrian shows, firework displays and all kinds of old-time amusements. Aquasierra – Córdoba is landlocked, far from the Mediterranean, and when you factor in the sub-tropical climate with scorching highs that hit the 40s in summer you’re going to need to cool off. The only water park in the province is one way to do it, and it’s open from June to September. Teenagers and little ones will be most pleased with the seven plunges and the massive pool with an artificial beach. If adults shell out a little more they can get a sunlounger and table at the VIP area, away from the crowds and noise.